(RALEIGH, NC) – Swedish sports manufacturer Salming, which last year received numerous accolades for their OCR specific model the OT Comp, and Savage Race Series, one of the largest and fastest-growing Obstacle Course Racing companies in the U.S, today announced a new level in their partnership. Salming has been named the official shoe of Savage Race, and will be part of the race day experience for all 14 of their events, which kick off on February 23rd in Gainesville, Florida. Salming Sports AB is a Swedish sporting goods company designing, developing and marketing high quality products for the Running, Handball, Floorball, Squash and Badminton markets under its Salming brand. The company has its head-office in Gothenburg on the west coast of Sweden with North American headquarters in Raleigh, NC. 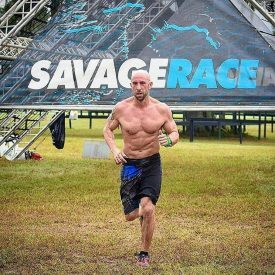 Savage Race, a Florida-based obstacle course race series, hosts fourteen events across the United States, and continues to add events each year. Savage Race is a true test of courage and teamwork as over 100,000 attendees annually push themselves to their limits to defeat its jaw-dropping obstacles. Savage Race has two distance formats: the all new Savage Blitz is 3 miles long with 15-20 obstacles, while the original Savage Race is 5-7 miles with 27+ obstacles. Savage Race participants across the country train hard to complete in the events, which test stamina, strength, agility, and mental grit, culminating in victory stories and muddy hugs. To learn more about Savage Race, please visit www.savagerace.com.